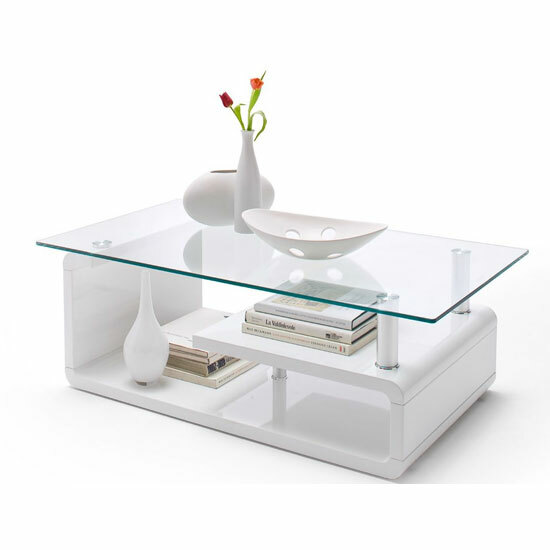 Modern rectangular coffee table is a trendy addition to any living room, office or reception room. Although contemporary furniture designers offer a plethora of fancy and unusual shapes, rectangular shape is one of the most practical options, as it fits even into the tiniest spaces (can be easily positioned against the wall, etc.). But if you are looking for optimal ways of integrating modern coffee table into your interior, here are few basic things that will require your consideration. Living room, office or reception room – regardless of where you place it, your coffee table should blend in seamlessly into your environment. Note, however, that miхed interior styles are currently in trend, so if you feel like integrating some vintage elements into your rustic interior, you might want to give it a try. Modern rectangular coffee tables made from solid wood may be quite pricey, but their exquisite look and long service period make up for the expenses. Depending on your interior design and style you may choose light woods such as pine and ash, dark brown models made from chestnut, or yellowish oak coffee tables, which, apart from their appealing look are also extremely durable. One of the best ways to cut costs on purchasing a modern rectangular coffee table is choosing an item made from reclaimed wood – such pieces of furniture are less expensive and still look stylish. Compared to genuine wood, MDF is generally considered to be a cheaper and less classy option, but you wouldn`t believe how stylish and exquisitely beautiful it can look. 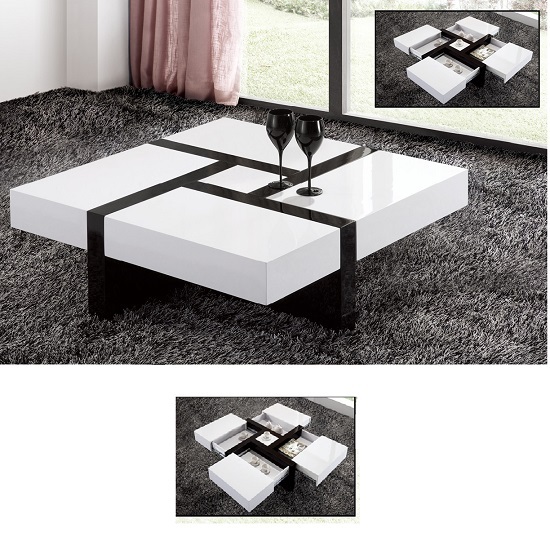 Trendy modern coffee tables made from high gloss MDF in black and white can become an excellent addition to contemporary sleek interiors. Moreover, such models are often encrusted with diamante inserts and led lights. In terms of durability, MDF board generally has shorter service period than solid wood, but if you plan to renovate your interior every 5-7 years or so, this may be the right option for you. Tempered glass is a highly safe and practical material used for making modern rectangular coffee tables perfectly integrated into almost any type of contemporary interior. 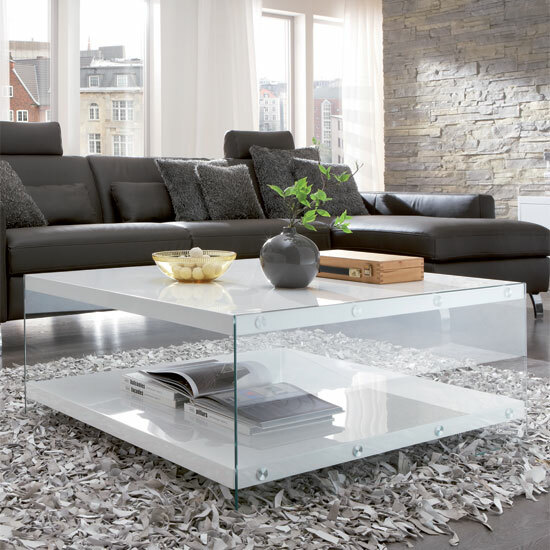 Completely transparent or made from smoked or tinted glass in combination with chrome elements, such coffee tables are excellent additions to any modern living room or reception room. However, you may want to consider a model with rounded corners, especially if you have children – you don’t want them to get accidentally hurt as they bump against sharp edges. Apart from its direct destination – i.e. allowing you to enjoying a cup of coffee with family, co-workers or friends, a coffee table may have lots of other functional usages. Before you hit the stores and start shopping for your perfect modern rectangular coffee table, ask yourself the following questions: will you be using it to store books, magazines, brochures, etc.? If so, the coffee table you choose may require additional shelves to accommodate them. Will you use your coffee table to work on your laptop? In this case, you may want to consider a coffee table with scratch-proof surface to ensure its long service period and attractive look. Some models may be extended to serve as full-fledged dining tables on special occasions – the choice is up to you. Last but not least, shopping with trusted retail chains and checking out the item you want to buy in a showroom ensures you won`t make a mistake and choose exactly the type of modern rectangular coffee table you need. As to reputable UK retailers, you might want to consider Furniture In Fashion . This store has a showroom based in Farnworth and an amazing choice of furniture of all design and styles from established manufacturers. The store has flexible pricing policy and regularly runs sales and clearances; moreover, they deliver across the UK in terms of (maximum) 10 business days.